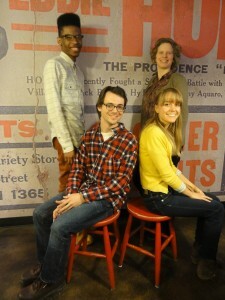 Research team: Gareth Butler, Micheline van Riemsdijk (team leader), Scott Basford, Alana Burnham. Dr. van Riemsdijk conducted a study of the governance of international skilled migration, funded by the National Science Foundation (Award #1155339, PI: Dr. Micheline van Riemsdijk, 2012-15). This project investigated the governance of international skilled migration at international, national, and local scales. In particular, the project examined the networks and scalar strategies of stakeholders to attract skilled migrants and influence migration policies. The study focused on two sectors that are in high need of skilled workers, the information technology sector and the oil and gas industry. The research findings provide insights into the actual practices of scaling, rescaling, and network modes of governance in migration policymaking. The project makes theoretical contributions to geographical understandings of scales and networks, including the possible emergence of new forms of governance. The findings of the project enhance understandings of the processes of international skilled migration, particularly the operation of global talent recruitment. Thus, this study informs policy debates about competitiveness and innovation in the global knowledge economy. • van Riemsdijk, Micheline, Scott Basford and Alana Burnham (available online). Socio-Cultural Incorporation of Skilled Migrants at Work: Employer and Migrant Perspectives. International Migration. doi: 10.1111/imig.12221. • Basford, Scott and Micheline van Riemsdijk (available online). The Role of Institutions in the Student Migrant Experience: Norway’s Quota Scheme. Population, Space and Place. doi: 10.1002/psp.2005. • van Riemsdijk, Micheline (2016). Governance of International Skilled Migration: Scalar Politics and Network Relations. Centre on Migration, Policy and Society Working Paper No. 129, University of Oxford. • van Riemsdijk, Micheline, 2014. “International migration and local emplacement: Everyday place-making practices of skilled migrants in Oslo, Norway” Environment and Planning A, 46, 963-979. • van Riemsdijk, Micheline 2015. “Agents of Local Incorporation: Skilled Migrant Organizations in Oslo, Norway.” Book chapter for Migrant Professionals in the City: Local Encounters, Identities, and Inequalities. This book is published by Routledge (ed. Lars Meier). • Presentation “Battle for the Brains: Attracting the Best and Brightest Workers” by Micheline van Riemsdijk at the University of Tennessee’s MicNite, November 2014. • Fafo report on International Talent Recruitment to Norway: Opportunities, Challenges, and Lived Experiences of Skilled Migrants by Micheline van Riemsdijk and Matthew Cook. • Broadcast of the FAFO seminar on international talent recruitment. Presented by Micheline van Riemsdijk on November 14, 2013 at FAFO (Institute for Labor and Social Research) in Oslo, Norway.